The Lesson I Learned Late In Life. 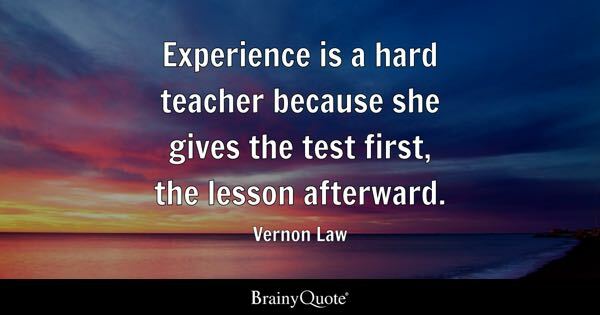 Life lessons appear in a variety of ways and could be from the least expected person or situation. My journey took me 20 years to know what was my lesson. While I was going through the experience I had no clue I was in a school. I knew it was a clearing of debris, mold, garbage and undesirable stuff. Still, I thought this was the ultimate. My school is not the one in a classroom setting as we all know. My life journey was in the classroom of life. The day came when my mirror was so squeaky clean and I saw myself. I was in amazement I reclaim my power as a woman. That was my pay off, although when you become dependent on a teacher it is a scary situation to move forward. I had to embrace and know it was time to go on with the tools that aided me on my life journey. My realization is people are all teachers and they come into our life for a season and a reason. When the lesson is completed that just what it is a lesson, bless the teacher and move on. May this article be of value. Much success to everyone. This is very true "My realization is people are all teachers and they come into our life for a season and a reason. When the lesson is completed that just what it is a lesson, bless the teacher and move on. " Life lessons are great especially when it helps you to soar to the top. Liked and shared so more people can see and read it. This is a valuable lesson and you're so right the classroom is not school, but real life is. When we're in school you have the jocks, cheerleaders and popular kids. But the ten years after the school it's usually the shy and nerdy kids who have blossomed into Peacocks. And we never stop learning until we leave this Earth. Thank you for sharing this I enjoyed reading and thinking on it.